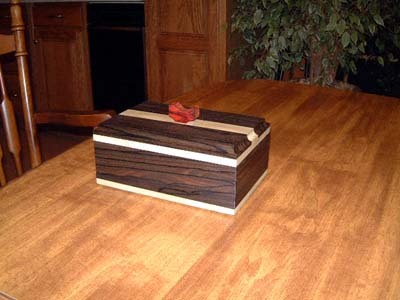 Rick LoDico - Exotic wood box. Here's one made from Ziricote, A South American hardwood, and American Holly with a small Cocobolo handle. The inside bottom is covered with green suede flocking, the mitered corners are splined with Holly and the entire box is finished with multiple coats of Danish Oil.